Reminisce Collection with its distinctive profiles, round drawer fronts and nostalgic nature evoke a sentimental longing for the “good old days”. Recalls warm memories of homecomings to Grandma’s house. With the use of Wormy Maple our new “Keepsake Finish” (a distressed, dry, low sheen finish) offers casual, unassuming charm and lets the unique character of each board shine through. Reminisce case pieces feature finished drawer boxes with English dovetailed corners and smooth, full extension slides. Conversion varnish gives your new bedroom suite a protective coat– This type of coating is not used on “disposable” furniture. 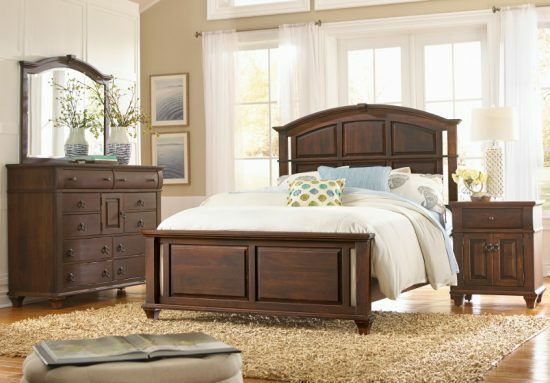 It is designed to safeguard the beauty and integrity of heirloom quality wood products. Reminisce beds are available in King, California King, Queen, Full, or Twin size. All pieces shown in wormy maple wood with Keepsake finish in coffee or driftwood color.